I thought a couple of graphs might best portray how the last 2 or 3 weeks have gone for me. 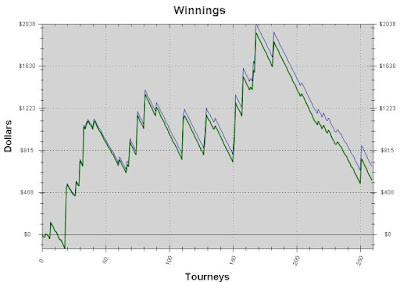 Basically I was doing incredibly well on Full Tilt, only to hit a 50 buy-in downswing...something I don't recall happening to me before. 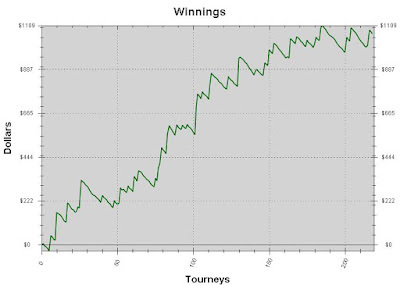 I was playing the $26 games on Full Tilt, but I've dropped down to the $6.50 and $12 45mans on Stars. I can't truthfully believe that I'm grinding such small stakes, but I'm surprised by how good my hourly rate is (even if I account for me running good by subtracting a fair amount off it, I'm still reasonably happy), and it looks like potentially steady money. Although that's what I thought on Full Tilt before my downswing scared me away. I'm happy continuing with these games on Stars for now, but like Amatay has suggested in his comments to me, my samples are far too small to draw too many conclusions from. 0 Comment to "A couple of graphs..."